JOMAX is easy: Mix with bleach and water, spray on, rinse off. No scrubbing or power wash equipment needed! JOMAX is economical: One gallon of JOMAX makes twenty gallons of solution - a fraction of the cost of pre-mix cleaners. 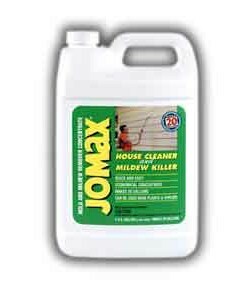 Use JOMAX for routine cleaning or for prepainted mildew control. Kills mildew on exterior non-porous surfaces such as: aluminum and vinyl siding and stucco; painted wood, doors and trim; painted brick, concrete or cement block; stained or painted decks and fences; and patio furniture. JOMAX is an EPA registered mildewcide concentrate. It's unique ChlorRelease bleach activator magnifies the strength of chlorine bleach but at low concentration levels so it will not damage painted surfaces and can be used near plants and shrubs. The detergent cleaning system in JOMAX loosens dirt and stains, eliminating the need for scrubbing. To clean mildew-infected surfaces, liberally apply properly mixed JOMAX solution... When used as directed JOMAX will not damage painted surfaces, aluminum or glass and can be used near plants and shrubs.